Download large files (over 30Mb) faster using LTE and Wi-Fi networks at the same time. 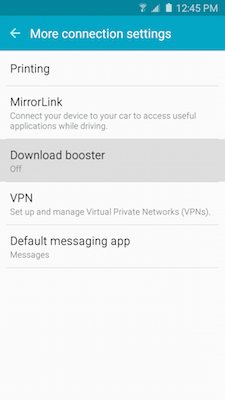 To use Download Booster, both Wi-Fi and Mobile data must be enabled. 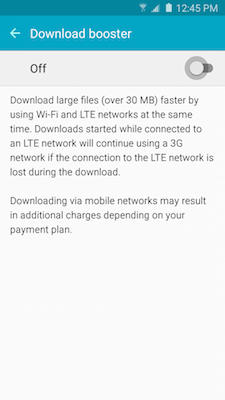 When Download Booster is enabled, any application that has been set to automatically download data when connected to a Wi-Fi network will use both LTE and Wi-Fi networks to download data while Download Booster is active. 3. 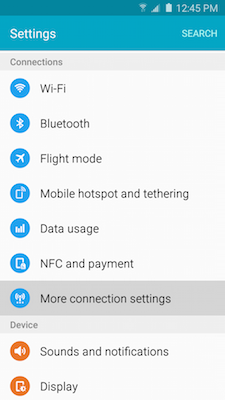 Scroll to and touch More connection settings under the Connections tab. 5. Touch the slider to turn Download booster on . 6. When Download booster is running, a message will pop-up showing speed information. If you do not want to see this message, mark the Do not show speed info checkbox.